It is this time of year again for me, the time when I get sick. Every year in February/March I come down with a tonsillitis or common cold, no matter how careful I am, still wearing a scarf and boots. I think the immune system is just down from the winter and needs to adjust to the new season, so the slightest stress or sneeze in your face can knock you out. Currently I am sick and writing this from my bed. 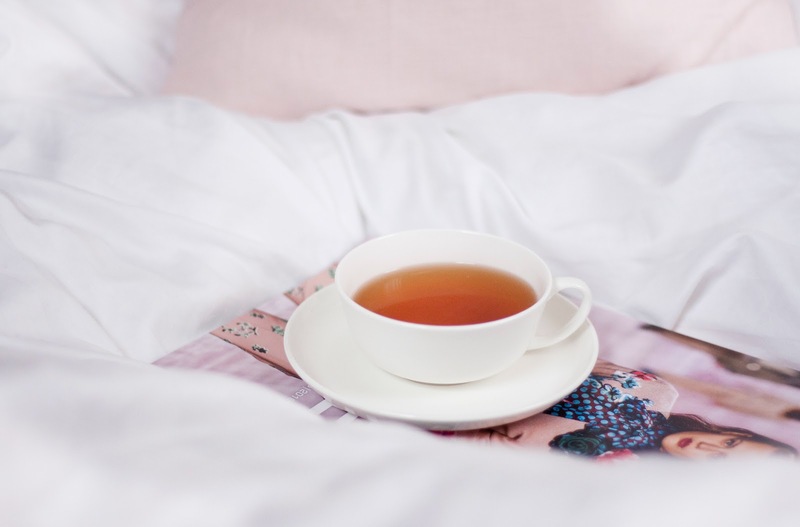 I thought there might be more little snuffles out there so I could share some tipps on how to get well soon when having a cold. Rest is the key to getting well. If needed, stay home from work for a day or two - not for a runny noise or headache but definitely if you're having a fever. Don't try to be a hero in that case! You'll only end up dragging your illness on. Sleep in as long as you need and take naps during the day. When I feel really bad I like to turn off my phone and shade the room completely. I usually feel better in the evenings and therefore am able to get up, eat a proper meal and take a shower. If you decided to still go to work, make sure to focus on sitting tasks like working through your email inbox but don't try to work on major things like new concepts. They can wait a few days. Drink lots of tea at your desk, don't forget to bring enough tissues, wash your hands often and bundle up in a sweater and scarf. Go home early if you can and go straight to bed. 1. Gargle & Brush your teeth often - this will help to fight the bacteria in your throat and really works wonders for me. You can gargle with teas or, how I like to do it, with mouth wash.
2. Inhalation - boil water, put in a big bowl and add chamomile, salt or essential oil. Breath in the steam while you hold a towel over your head. Inhalation will help to get out the mucus from the nose, sinuses, bronchia and lungs. 3. Take a hot bath - same steam effect. 4. Add ginger, lemon or/and honey to your tea. Generally drink a lot! 5. Footbaths where the temperature slowly rises are said to positively influence your airways. 6. If you are running a fever, cold compresses will help to get your body temperature down. Soak kitchen towels in cold water, wrap around calves and wrap regular towels around them. Get under a blanket so you stay warm. Change compresses before they get too warm or you get too cold. Some people say that they loose their appetite when they are sick. Not me! I feel like I need to eat to help my body have energy to fight the disease. I usually don't change my diet much but you'll definitely want to have chicken and vegetable soup to get some fat and lots of vitamins in. Fruit of course has lots of vitamins as well but the acid might be too aggressive for your throat. Spicy food can be helpful too in some cases to get your sweating on. Garlic, onions and radish act antibacterial. 1. Make phone calls - whether you take care of stuff or you call your friends & family. 2. Tidy up - your flat will probably look like a mess after a few days of illness so clean up! 3. Don't think anyone could ever not think of this but catch up on your favorite series and new movies. 4. Read a book, magazines and blogs. 5. Plan your next trip/vacation. 6. Do some online shopping. 7. Think of ways to optimize your flat. Do you want to paint a wall? Move the couch to the other side of the room? Does the hallway lack a sideboard? What about a new art piece? 8. Clean up your computer, update your software and make backups on an external drive. 9. Try some silly apps. The inspiration for this post came from Glitter Everywhere!